(A) Section 11 (1) (a) to ( o) of The Prevention of Cruelty to Animals Act, 1960 lays down the actions that amounts to treating animals cruelly. Sect 11(1)(a) Beating, Kicking, Over-riding, Over-driving, Over-loading, Torturing, Causing unnecessary pain or suffering to any animals. (b) Employing any animal which, by reason of its age or any disease, unfit to be so employed, and still making it work or labour or for any purpose. (c) Willfully and unreasonably administering any injurious drug or injurious substance. (d) Conveying or carrying, either in or upon any vehicle in such a manner as to subject it to unnecessary pain or suffering. (e) Keeping for confining any animal in any cage or any receptacle which does not measure sufficiently in height, length and breadth to permit the animal a reasonable opportunity for movement. (f) keeping for an unreasonable time any animal chained or tethered upon an unreasonably heavy chain or chord. (g) being the owner, neglects to exercise or cause to be exercised reasonably any dog habitually chained up or kept in close confinement. (h) Being the owner of any animal fails to provide such animal with sufficient food, drink or shelter. (i) Without reasonable cause, abandons any animal in circumstances which render it likely that it will suffer pain by reason of starvation or thirst. (j) willfully permiting any animals, of which he is the owner to go at large in any street while the animal is affected with contagious or infectious disease, or without reasonable excuse permits any diseased or disabled animal, of which he is the owner, to die in any street. (l) mutilates any animal or kills any animal ( including stray dogs) by using the method of strychnine injections in the heart or in any other unnecessarily cruel manner. 1. confines or causes to be confined any animals ( including tying of an animal as bait in a tiger or other sanctuary) so as to make it an oject of prey for any other animal. 2. incites any animal to fight or bait any other animal. (n) Organises, keeps, uses or acts in the management of, any place for animal fighting or for the purpose of baiting any animal or permits or offers any place to be so used or receives money for the admission of any other person to any place kept or used for any such purposes. (o) Promotes or takes part in any shooting match or competition wherein animals are released from captivity for the purpose of such shooting. (Q 2) Is treating animal cruelly, a punishable offence? (A) Yes. If any animal is treated in any cruel way, rather in any of the ways provided under Section11(a) to (o) of The Prevention Of Cruelty to Animals act,1960., the offender ( in the case of a first offence) will have to pay fine which shall extend to fifty rupees and if it is the case of second offence or subsequent offence committed within three years of the previous offence, he will be fined with not less than twenty-five rupees but which may extend to one hundred rupees or with the imprisonment for a term which may extend to three months or with both. Also, in the case of second offence, the offender’s vehicle is confiscated, and he will never be allowed to keep an animal again. (Q 3) What are the common offences against the PCA and which ones are cognizable? Organises, keeps, uses or acts in the management of, any place for animal fighting or for the purpose of baiting any animal or permits or offers any place to be so used or receives money for the admission of any other person to any place kept or used for any such purposes; Section 11(1) (n) Cog. Promotes or takes part in any shooting match or competition wherein animals are released from captivity for the purpose of such shooting. Section 11(1) (o) Cog. If any person performs upon any cow or other milk animal the operation called phooka or any other operation, including injection of oxytocin given by dairies to their milk animals in order to induce milk, which is injurious to health Section 12 Cog. (Q 4) Can an individual ‘arrest’ someone who is treating an animal cruelly and bring him to a police station? (A) The Police officer has every power provided to him in the law to arrest any offender, found to be involved in an illegal activity. And likewise, he has the power to arrest any one who is found to be treating animals with cruelty. But even a private person can do so. Section 43 of Cr.P.C. confers the power on every private person to arrest or cause to be arrested any person who has committed a non-bailable and cognizable offence. The only condition precedent is that such offence should have been committed in the presence of the arresting person. Hence, every person, has the power to arrest subject to the following conditions namely first, the offence should be a non-bailable and cognizable offence; secondly, the offence should have been committed in his presence and lastly, the person so arrested, without unnecessary delays, should be handed over to a Police officer or, in the absence of the Police Officer, take such person or cause him to be taken in custody to the nearest Police station. The Police Officer shall re-arrest such person in accordance with Section 41 of Cr.P.C. (Q 5) If a person kills other person’s dog or any other pet deliberately, what action should be taken? (A) Killing of a dog or other pet is absolutely illegal and very inhumane and its almost like murdering a human being. The act amounts to cruelty on animals defined under Section 11of The Prevention Of Cruelty to Animals.This amounts to serious offence. And it must be immediately lodged as F.I.R with the area police station . It is an offence committed under Section 428 and Section 429 of Indian Penal Code. Section 428 of the IPC deals with the punishment for committing mischief by killing, poisoning, maiming or rendering useless any animal or animals of the value of ten rupees or upwards. The punishment for such acts amounts to imprisonment of either description for a term which may extend to two years, or with fine, or with both. While Section 429 of the IPC deals with the punishment for the same nature of crime but for the animals of the value of fifty rupees or upwards. The punishment in this case will be imprisonment of either description for a term which may extend to five years or with fine, or with both. (Q 6) What is the legal action to be taken on a complaint of stealing of a dog or any other animal? (A) Section 378 of Indian Penal Code, 1860 deals with ‘ Theft’, stating that whoever, intending to take dishonestly any moveable property out of the possession of any person without that person’s consent, moves that property in order to such taking, is said to commit theft. And the property, under this section includes ‘animals’ too. The section itself explains on the matter related to animals. A person, who by any means causes an animal to move, is said to move that animal without the consent of the owner. For example; A, being Z’s servant and entrusted by z with the care of his dog, takes the dog and sells it to the other party, without z’s consent. The act of A will amount to theft. Pet, or any other animal within the possession of the owner, is considered to be the property of the owner. And any property , taken away from the owner, without the consent of the owner, amounts to theft. Section 379 of Indian Penal Code,1860, penalizes ‘theft’. Under this Section, the punishment of theft is imprisonment of either description for a term which may extend to three years, or with fine, or with both. So, like in any other theft case , the procedure will the same. When a person approaches the police station with the complaint regarding the theft of an animal, the complainant should be encouraged to give a detailed description of the lost animal, if possible with a photograph. And it should be immediately filed as an F.I.R in the police registrar, the copy of which should be duly signed, stamped and dated, along with the time and be handed to the complainant. The officer of police station is responsible for making all the necessary entries. 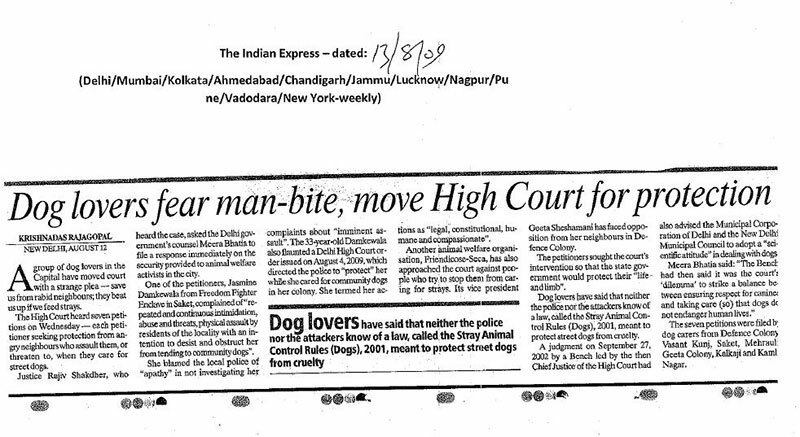 The complainant has every right on filing an F.I.R..This should be read together with the Prevention of Cruelty to Animals Act 1960 as forcibly taking an animal out of its environs amounts to cruelty. (Q 7) In a complaint under Section 428/429 of the IPC in respect of a dog of the complainant who has been poisoned by a neighbour, what kind of evidence should be looked and asked for? (A) If the owner believes that the neighbour is responsible, the owner should immediately contact the nearest police officer. 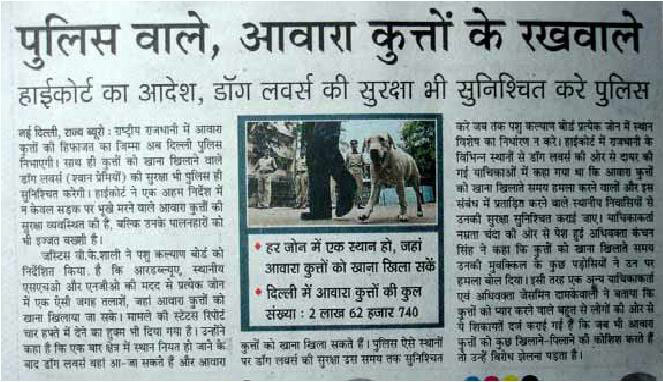 The police officer should visit the site and note the condition of the dog. The dog has to be taken to a vet, either private or government, for a post-mortem to determine the cause and approximate time of death. In the meantime the police officer can collect whatever evidence is available, indicating both the perpetrator and the method used. The police officer must record the statement of the witnesses who have seen the poisoning or witnesses who can record the relationship of the alleged perpetrator to the deceased. Thereafter, the police officer must put up a challan before the court of the concerned magistrate. (Q 8) Can people who feed animals in their areas be stopped by the RWAs or Societies or neighbours under the law ? 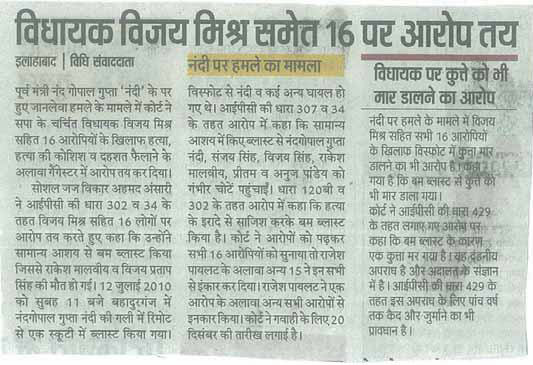 Article 19 of the Constitution of India, deals with right to freedom and in this freedom comes the right to profession, occupation, trade and business. Therefore, it means that every citizen has the right to occupation and if someone has taken the caring of animals as his occupation, it is legal and he has every right to carry on with his occupation. Article 21 of the Constitution of India states the right to personal life and liberty. Now this is the very vast right. If someone wants to feed dogs and provides shelter to the dogs, he has every liberty to do so. He has this right to liberty that the law provides to every citizen of India. But, above every law and rights, there is a natural right too, which is a universal right, that is inherent in the nature of ethics and contingent on human actions or beliefs. It is the right that is claimed to exist even when it is not enforced by the government or society as a whole. It is the right of the individual and considered beyond the authority of a government or international body to dismiss. Therefore, if there are any rights at all, there must be right to liberty, for all the others depend on this. And, loving, caring and feeding and giving shelter to dogs, definitely is a natural right of any individual. 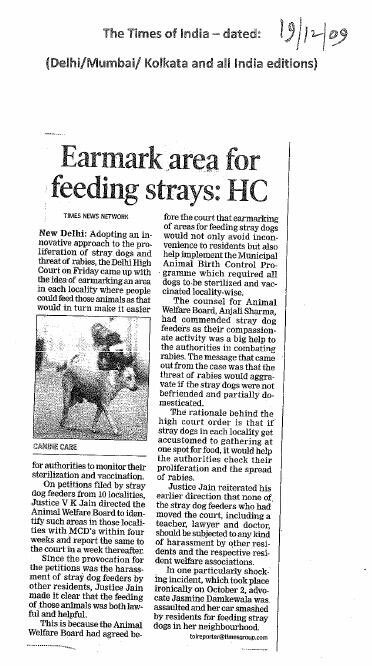 In a judgment passed by the Delhi Court, it has been stated that the Animal Welfare Board of India and the Municipal authorities have in the guidelines issued by them specified the problem often faced by the individuals and families who adopts stray animals and feed them and come to the assistance of such persons. 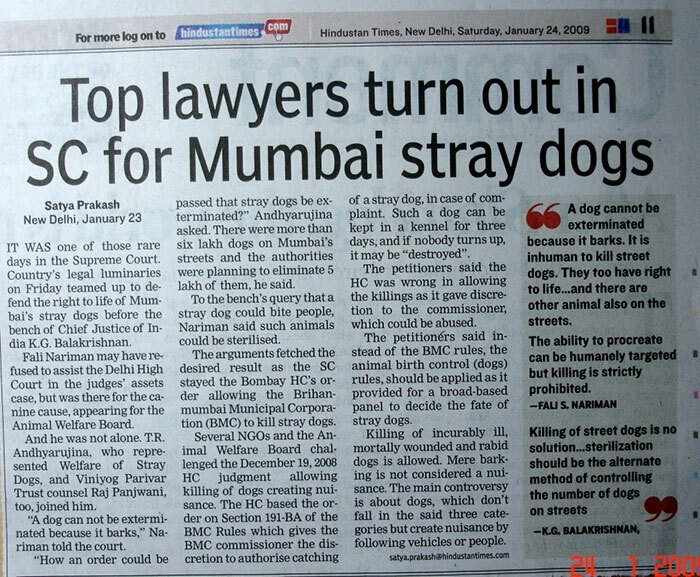 The court says, that it is necessary to bring into record that these individuals and families who adopt stray animals are doing a great service to the humanity as they are acting in the aid and assistance of municipal authorities by providing these animals with food and shelter and also by getting them vaccinated and sterilized. Without assistance of such persons no local municipal authority can successfully carry out its ABC programs. 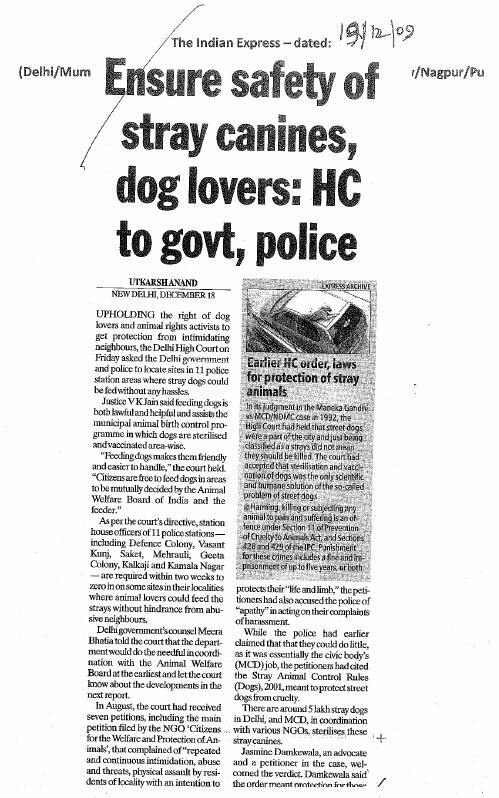 The court has went on to say that the local police and the municipal authorities are under the obligation not only to encourage such adoption but also to ensure that such persons who come forward to take care of these animals specifically the community or neighbourhood dogs so that they are not subjected to any kind of cruelty. And finally, the court has said that every individual has a right to live his life in the manner he wants and it is necessary that the society and the community recognizes it. 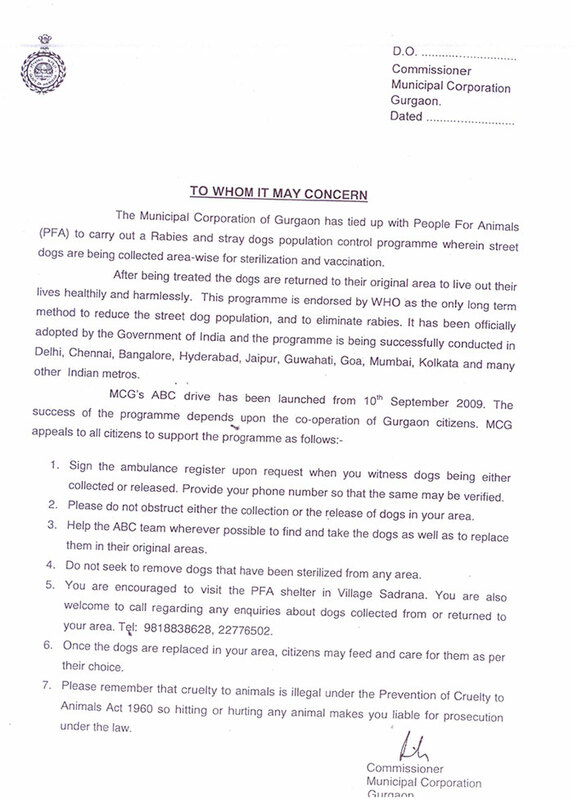 (A) Under the GOI Animal Birth Control rules 2001 , no sterilized dogs can be relocated from their area. 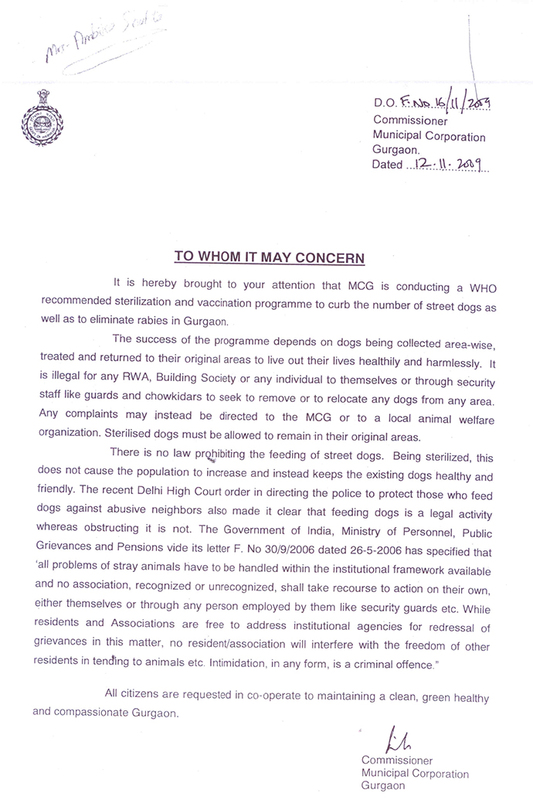 Under 5 High Court orders , sterilized dogs have to be in their original areas. Even if the dog is not sterilized , the Society can simply ask an animal welfare organization to sterilize and vaccinate the dog. They cannot relocate him. Relocation is not permissible as it would cause more problems such as increase of dog bites as dogs are territorial by nature and fight to retain their areas keeping out other dogs. (Q 10) Does practicing phooka or doom dev amounts to cruelty ? (A) Yes. Section 12 of The Prevention of Cruelty to Animals Act, 1960, penalizes practicing of phooka or doom dev or any other operation being performed upon any cow or other milk animal, to improve its lactation. This is injurious to health of the animal. And the person shall be punishable with fine which may extend to one thousand rupees, or with the imprisonment for a term which may extend to two years, or with both and the animal on which the operation was performed shall be forfeited to the Government. (Q 11) Dairies give their milk animals injections of oxytocin in order to induce milk. Is this legal ? (A) Use of Oxytocin Inj. on milking animal in order to induce milk is illegal and amounts to the cruelty on animal under Section 12 of The Prevention of Cruelty to Animals Act,1960. And the person shall be punishable with fine which may extend to one thousand rupees, or with the imprisonment for a term which may extend to two years, or with both and the animal on which the operation was performed shall be forfeited to the Government. The proprietor shall be liable to lose his license as a pharmacist and shopkeeper in addition to criminal charges with punishment of up to 5 years in prison. The Government of India has acknowledged the negative effects of oxytocin and has declared it as a scheduled substance. It is illegal under the Food and Drug Adulteration act to give these injections. These rule apply to the milkmen too. 1. The drug, Oxytocin Inj. Has been taken under the purview of Prescription drugs, so that no person/milkman can purchase the drug without having requisite prescription from Registered Medical Practitioner or Registered Veterinarian. 2. All State Drug Controllers and Zonal Officers of the CDSCO have been altered to check th reported abuse of Oxytocin Inj. By the milkman for letting out more milk from cows. But, despite the above directions Oxytocin ampules are easily and readily available not only from the chemists but also from other unauthorized outlets catering to the requirements of the dairy owners. This indiscriminate misuse of Oxytocin is one of the primary contributory factors in drastically reducing the economic span of a cow/buffalo.Oxytocin not only inflicts agaony and disease on the animals but it also enters the milk posing a serious threat on the health of animal. (Q 12) How to know if dairymen or milkmen are using the drug? (A) If oxytocin is being used, there will be marks and bruises caused by the needles all over the body of the cow. Needles, syringes,discarded veals, blood soaked cottons can be spotted lying about near the milking animal. (Q 13) Is exhibition and training of performing animals restricted? (A) Yes, Section 22 of The Prevention of Cruelty to Animals Act, 1960 restricts the exhibition and training of performing animals, unless the person interested in exhibiting and training the animal is registered in accordance with provisions of the Act. And also, no animal can be exhibited or trained, if the Central Government , by notification in the Official Gazette, has restricted the exhibition and training on that animal. (Q 14) So, if a person is interested in exihibiting and training of performing animals, are there conditions for the registration? (A) The first and foremost condition required to be fulfilled with regard to the permission for exhibiting and training of performing animals is the registration of the person. Section 3 The Performing Animals ( Registration) Rules,2001, provides for Application of registration stating that any person desirous of training or exhibiting a peforming animals has to apply for registration to the prescribed authority. Without being registered he is not allowed to exhibit or train any animal as a performing animal. 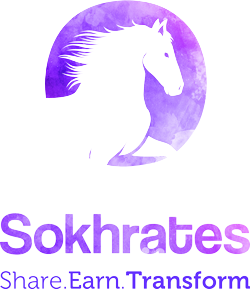 (20) The owner shall ensure that the animal is not made or incited to fight against other animal sand shall further ensure that the sedatives or tranquillisers or steroids or any other srtificial enhancers are not administered to or inserted in any animal. (21) The owner shall ensure that the animal shall not be transported or be kept or confined in cages and receptacles which do not measure in height, breadth or lenghth in accordance with the comfort of animal. (22) The owner shall ensure that the animal is not continuously used for excessive number of takes in shooting a film without providing adequated rest to the animal and in the event of a snake being used it shall not be made to ingest any substances or made to crawl acroos tarred or any other heatened surface and shall not be contorted to wrestle. 6. no horse shall be raced, where the period of journey exceeds six hours, unless twenty fours have elapsed since completion of the travel. (Q 15) Does the Prevention of Cruelty to Animals Act, 1960 provides any procedure for registration with regard to the exhibition and training of performing animals? (A) Yes, Section 23 of the above mentioned Act provides for the procedure for registration. There are five conditions that need to be fulfilled with regard to the registration of performing animals. 1. Every person desirous of exhibiting or training any performing animal has to make an application in the prescribed form, to the prescribed authority and on payment of the prescribed fee. 2. An application for registration contains such particulars as to the animals and as to the general nature of the performances in which the animals are to be exhibited or for which they are to be trained and the particulars so given shall be entertained in the register maintained by the prescribed authority. 3. The prescribed authority shall give to every person whose name appears on the register kept by them, a certificate of registration in the prescribed form containing the particulars entered in the register. 4. Every register is open for the inspection by any person on payment of prescribed fee. 5. And the person whose name is entered in the register , is entitled, on making an application for the purpose, to have the particulars entered in the register with respect to him varied, and where any such particulars are so varied, the existing shall be cancelled and a new certificate will be issued. (Q 16) What does it mean by prescribed authority and the prescribed payment of fee for registration? What are the performing animals? And also, what is the prescribed payment of fee for inspection of the register by any person? (A) Under Section 2 ( b ), of The Performing Animals Rules, 1973 says that performing animal means any animal which is used for the purpose of any entertainment to which the public are admitted through the sale of tickets. Section 5 of The Prevention of Cruelty to Animals Act,1960 provides the constitution of the Board which is the prescribed authority under this Act and for all other rules of this Act. (3) The Central Government shall nominate one of the members of the Board to be its chairman and another member of the board to be its Vice-Chairman. Section 4 of The Performing Animals Rules, 1973 talks about fee and registration which says that every application for registration shall be accompanied by a fee of rupees twenty-five which can be either paid in cash or in such other manner as may be specified by the prescribed authority. Section 7 of The Performing Animals Rules,1973 says that anyone who is interested in inspecting the register of can do so during office hours on any working day on a payment of a fee of two rupees. (Q 17) What rules the Central Government have with regard to the Performing Animals Registration ? (A) The Central Government has prescribed few rules with regard to the registration of the performing animals. The necessary rules are provided in The Performing Animals ( Registration) Rules,2001. Section 2(g) says that prescribed authority means the central government, or such other authority including the Board or the state government, as may be authorized by the central government. Section 2(h) says that the performing animal means an animal which is used at or for the purpose of any entertainment including a film or an equine event to which the public are admitted. Section 4 talks about the fee and registration, where every application for registration shall be accompanied by a fee of rupees five hundred. (Q 18) What are the acts that amounts to offences with regard to the performing animals? The person found guilty o f such offences will be punishable on conviction with fine which may extend to five hundred rupees, or with imprisonment which may extend to three months or with both. (Q 19) Is it an offence to train or exhibit an animal for police purpose? (A) No. Section 27 of The Prevention of Cruelty to Animal Acts, 1960 acts as exemption clause. It permits the training of animals for bona fide military or police purposes . However, Section 11 of The Prevention of Cruelty to Animal Acts,1960 applies to those animals too. It has to be kept in mind that no animals are treated cruelly or in a way that harms them. (Q 20) Does Police have the power to inspect the premises in which any performing animals are being trained or exhibited? (A) Yes. If it comes to the knowledge of the Police officer that the training or exhibition of any performing animal has been accompanied by unnecessary pain or suffering, Section 25 of The Prevention of Cruelty to Animals Act,1960, provides that any police officer not below the rank of sub-inspector may enter at all reasonable times and inspect any premises in which any performing animals are being trained or exhibited or kept for training or exhibition and ask for the certificate of registration from the trainer or exhibitor. (Q 21) Does The Prevention of Cruelty to Animals Act, 1960, provides the powers of search and seizure to the police? (A) Yes. Section 32 of the Act, states that if a police officer not below the rank of sub-inspector, has reason to believe that an offence of cruelty has been committed or that any person has in his possession the skin of any such animal with any part of the head attached thereto, he may enter and search place or any place in which he has the reason to believe any such skin to be, and may seize such skin or any article or thing used or intended to be used in the commission of such offence. Also, if the police officer, not below the rank of sub-inspector, has reason to believe that phooka or any other operation of the nature referred to in Section12, has been performed or will be performed on any animal within the limits of his jurisdiction, he may enter any place in which he has reason to believe such animal to be, and may seize the animal and produce it for the examination by the veterinary officer in charge of the area in which the animal is seized. (Q 21) What is the maximum loads for draught animals? (A) Below is the table, stating the specific animals meant for drawing a vehicle of the kind with the load of excess weight. (Q 22) What is the maximum load of certain pack animals? (A) Below is the Table provided specifying animal allowed to carry loads along with the excess weight . (Q 23) What are the powers provided to police officers under The Prevention of Cruelty to Draught and Pack Animals Rules,1965? (A) Section 11 of the Act, provides that if police officer above the rank of a constable feels that the rule of reasonable excess weight with regard to the draught and pack animals is getting violated, he may, ask the owner or the other person in charge of such animal to take the animal or the vehicle or both to the weighbridge for the purpose of determining the weight of the load which animal has been or is drawing or carrying. And if the owner incharge of the aforesaid animals refuses to comply with the demand of the police officer , the policeman has every right to take the animal or the vehicle or both to the weighbridge and get it measured. And as soon as any weight is determined under this rule, the owner or other person in charge of the said animal shall be given a statement in writing signed by the police officer as to the weight so determined and any other information relevant for the purpose. (Q 24) What are the general conditions for the use of draught and pack animals? any area where the temperature exceeds 37 degree C ( 99 degree F ) during the period between 12 noon and 3 p.m.
(Q 25) What are other relevant provisions with regard to The Prevention of Cruelty To Draught And Pack Animals Rules,1965? Section 7:- Animals to be disengaged after work:- No person shall continue to keep in harness any animal used for the purpose of drawing vehicles, after it is no longer needed for such purpose. Section 8:- Use of spiked bits prohibited:- No person shall, for the purpose of driving or riding an animal or causing it to draw any vehicle or for otherwise controlling it, use any spiked stick or any other sharp tackle or equipment which causes brusies,swellings, abrasions or sever pain to the animal. Section 9:- Saddling of horses:- No person shall cause a horse to be saddled in such a way that the harness rests directly on the animal’s withers without there being sufficient clearance between the arch or the saddle and the withers. (Q 26) What are the general conditions of transport of animals? (A) Section 98 of The Transport of Animals Rules,1978 provides the general conditions of transport of animals. 1. Animals to be transported shall be healthy and in good condition. They should be examined by a veterinary doctor for freedom from infectious diseases and their fitness to undertake the journey, provided that the nature and duration of the proposed journey shall be taken into account while deciding upon the degree of fitness. 2. An animal which is unfit for transport shall not be transported and the animals who are new born, diseased, blind emaciated, lame, fatigued or having given birth during the preceding seventy two hours or likely to give birth during transport shall not be transported. 3) Pregnant and very young animals shall not be mixed with other animals during transport. 1. Different classes of animals shall be kept separately during the transport. 2. Diseased animals, whenever transported for treatment, shall not be mixed with other animals. (Q 27) What should be looked for when animals are being transported? (A) As mentioned above, the general conditions laid down in Section 98 of The Transport of Animals Rules,1978 should be strictly adhered to. And apart from that, there are different rules for transporting different categories of animal, provided under The Transport of Animals Rules, 1978. Monkeys are to be transported in suitable wooden or bamboo cages. The following two sizes of cages shall be used during the transportation of monkeys through rail. 1. 910 x 760 x 510 mm- This cage shall contain not more than twelve monkeys, weighing between 1.8 and 3.00 kilograms each or ten monkeys weighing between 3.1 and 5.0 kilograms each. 2. 710 x 710 x 519 mm- This cage shall contain not more than ten monkeys weighing between 1.8 and 3.00 kilograms each or eight monkeys weighing between 3.1 and 5.00 kilograms each. Also, not more than one cage shall be placed over the other and gunny packing shall be placed between two cages, when one is placed over the other. But when the monkeys are transported by air the following two sizes of cages shall be used. 1. 460 x 460 x 460 mm- This cage shall contain not more than ten monkeys weighing from 1.8 to 3.0 kilograms each or four monkeys weighing from 3.1 to 5.0 kilograms each. 2. 760 x 530 x 460 mm :- This cage shall contain not more than ten monkeys weighing from 1.8 to 3.0 kilograms each or eight monkeys weighing from 3.1 to 5.0 kilograms each. When cattle is to be transported by rail an ordinary goods wagon shall carry not more than ten adult cattle or fifteen calves on broad gauge, not more than six adult cattle or ten calves on meter gauge, or not more than four adult cattle or six calves on narrow gauge. And while transporting cattle by goods vehicle, only six cattle should be loaded. For the transport of equines by rail, ordinary goods wagon when used for transportation shall carry not more than eight to ten horses or ten mules or ten donkeys on broad gauge and not more than six horses or eight donkeys on meter- gauge. And if equines are to be transported by good-vehicles each vehicles should not carry more than four to six equines. For the transport of equines by sea, horses may normally be accommodated in single stalls and mules in pens, each pen holding four to five mules. Following is the chart of transport of sheep and goats through railway wagon, for different gauge. And the Goods vehicle of capacity of 5 or 4.5 tons, which are generally used for transporting animals, shall not carry more than forty sheep or goats. Containers are used for transporting poultry by rail, road and air. There is specific number of different kind of poultry to be transported in containers. In transport of pigs by road, good vehicles which are generally used for transporting of animals shall not carry more than twenty pigs. The Vehicle transporting them should be large enough to carry animals comfortably and the animals should not be packed and jammed inside. The animals should also be protected from the weather. The permissible loading in a truck is only 4 buffaloes or 40 sheep/goats, and truck having wheel base below 142 inches, shall not carry more than five cattle without calves or four with calves. In the case of trucks whose wheel base is over 142 inches shall not carry more than six cattle without calves or five with calves. Animals in tempo are not allowed. Only four passengers excluding the driver are allowed on a tonga or a total of 325 kgs. (Q 28) What does law provides with respect to the slaughtering houses? (A) There are certain rules provided under The Prevention Of Cruelty To Animals ( Slaughter House) Rules, 2001. Section 2(c) of the above mentioned Act defines ‘slaughter house’ as a slaughter house wherein 10 or more than 10 animals are slaughtered per day and is duly licensed or recognized under a Central, State or Provincial Act or any rules or regulations made thereunder. (Q 29) What is the law regarding the slaughtering of animals? has not been certified by a veterinary doctor that it is in a fit condition to be slaughtered. (Q 30) Is slaughtering of animal apart from the slaughter house forbidden? (A) Wherever there is a Government slaughter-house, the slaughter cannot be done anywhere else. If there is no government slaughter house in that area then killing can only take place in licenced slaughter houses which should be situated where they are not public nusisance and an environmental hazard. These slaughterhouses have to follow the Municipal Corporation laws and the ISI regulations. Lambs or any other animals cannot be slaughtered in slums, in roadside ramshackle meat shops or in dhabas or in private houses. (Q 31) Is it crime to sell camel’s meat? (A) Camel’s meat is not notified item of food, as per the provisions of the prevention of cruelty to animals act,1960.Presently, provision is available, only for slaughtering cattle, goat, sheep and pig, within the Corporation limits. There is no qualified Veterinary Surgeon, who can certify the fitness of a camel or the suitability of its meat for consumption by human beings, or a licensed person to slaughter a camel.There are no licensed persons within the Corporation limits for the sale of camel’s meat also. The license to sell beef will not enable the sale of camel’s meat. (Q 32) What does the law says regarding the conducting of experiments on animals? 2. Experiments shall be performed in every case by or under the supervision of persons duly qualified, in a laboratory adequately equipped and staffed for the purpose and under the responsibility of the person performing the experiment. 4. Experiments involving operative procedure more severe than simple inoculation or superficial venesection shall be performed under the influence of anaesthetic of sufficient power to prevent the animal feeling pain and it shall remain so throughtout the experiment. 5. The experiment shall not be performed for the purpose of attaining or retaining manual skill. (Q 33) Is it illegal to sell animals for experiments? (A) Yes, it is illegal to sale animals for experiments. Section 4A of The Experiments on Animals ( control and Supervision) puts restriction on sale, etc., of animals for experiments. It says that no officer, employee or agent of any animal-control authority shall see, give transfer, trade, supply or otherwise provide any animal coming into his or her possession to any animal dealer, commercial kennel, pet shop, laboratory, educational institution or other person for the use in research, product development testing, education, biological production or other scientific, biomedical or veterinary purposes. Also the hospital, educational institution, laboratory or any person is prohibited to purchase or accept any dog or cat not purposely bred for research from any animal-control authority, commercial kennel, pet shop or animal dealer for use in research, product development, testing, education, biological production, or other scientific, biomedical or veterinary purposes. (Q 34) what kind of birds is it legal to keep? (A) “ Keeping’ of a bird, if it entails a cage, is the worst form of cruelty which a man can inflict, depriving the bird of not only its natural habitat but also its right to fly. No Indian birds can be legally kept under the Wild Life Protection Act, 1972. Only exotic species can be kept and that too if the seller/ owner establishes that they have come from outside the country. In order to prove that the seller must have an import licence and permission from the CITES bureau. CITIES or the United Nations Convention On International Trade In Endangered Species Of Wild Fauna And Flora came into effect in order to protect rare and endangered species of wild fauna and flora against over-exploitation. The convention ensure that international trade does not pose a threat to the survival of species in the wild. The convention also provides strict regulation over export of those species threatened with export of those species threatened with extinction which may be affected by trade. No permits are issued fro international trade of giant panda, elephant, great apes, rhinos, great whales and the large cats including the tiger. The criteria for prohibiting the international trade of certain species is that if the status of the specific species is seriously declining it should be prohibited. 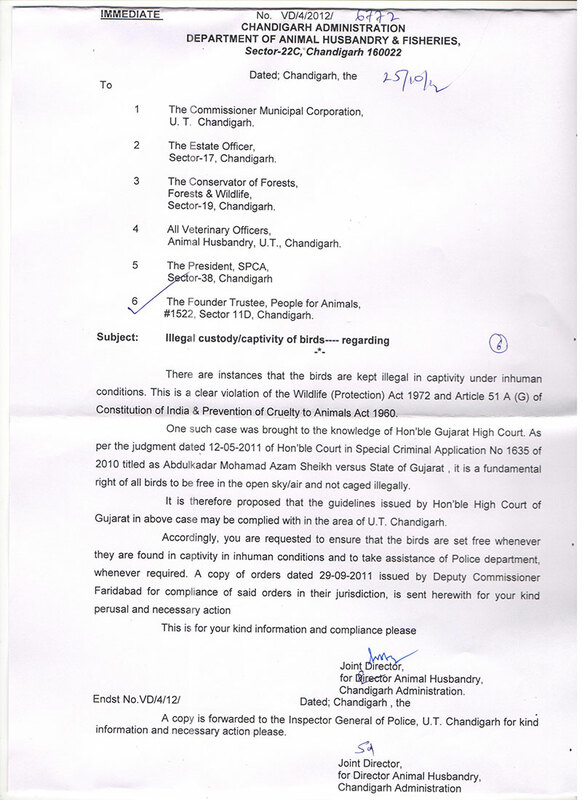 Further, the keeping of a permissible bird must be in conformity with the provisions of Section 11 of the Prevention of Cruelty to Animals Act, which stipulates that any person who keeps and confines any animal in any cage which does not measure sufficiently to permit the bird of a reasonable opportunity of movement or does not provide the bird with sufficient food, drink and shelter shall be guilty of treating that bird cruelly. The failure to comply with these provisions of Section 11 of PCA is a cognizable offence and the person would be liable to be arrested and punished. Hence the sane and safe course of action is to let the birds be free. (Q 35) What does the law says about selling of the Wild bird in the local market? (A) The word ‘ wild bird’ itself means a bird that has come under The Wild Life Protection Act, 1972, which extends its protection to about 122 species of birds. Section 9 of the WPA prohibits hunting of wild birds. “Hunting” in common parlance signifies the pursuit, trapping and then killing of an animal. But under the WPA ‘hunting’ also includes capturing and trapping of any wild animal. Further,Section 57 of W.P.A raises a legal presumption that if a person is in possession, custody or control of any captive animal ( including wild birds), it shall be presumed that such a person is not lawful possession of such captive animal. Hence, a person selling a wild bird in the local market is guilty of the offence of ‘hunting’ and is liable to be punished with imprisonment for a term which may extend to three years as stipulated under Section 51 of the WPA. (Q 36) Does Police have the power to arrest under the Wild Life Protection Act? (A) Section 50 of WPA authorizes the Director, or the Chief Wildlife Warden or any officer authorized by them or any forest officer or any police officer not below the rank of sub-inspector to arrest any person without warrant and detain him, if the arresting officer has reasonable grounds for believing that such person has committed an offence against the WPA. And Section 51(1) of the WPA stipulates that any person who contravenes any provision of Act or any rule or order made thereunder….shall be guilty of an offences against this Act and shall, on conviction, be punishable with imprisonment for a term which may extend to three years or with fine which may extend to twenty-five thousands or with both.